"La verdad que el servicio recibido ha sido muy bueno y rapido." Larimar oval pendant with sterling silver Made in sterling silver, this oval-shaped pendant features a larimar cabochon. The pendant with its handle measures between 38 mm x 20 mm and 34 mm x 16 mm. Larimar in a beautiful blue stone that, according to its metaphysical properties, combats stress and tension. Promotes communication and affection. Turkish evil eye pendant with round silver wrap. A delicate heart-shaped pendant of sterling silver enveloping a Turkish glass evil eye, murano style. This amulet against the evil eye measures about 14 mm x 12 mm counting with its ring. The Turkish evil eye, present in several cultures has been used for protection for several generations. Made in Turkey. Openwork pendant Gothic style in sterling silver with natural gems. It is a pendant model in sterling silver with openwork, and a natural oval gem that can be moonstone, labradorite or amethyst. 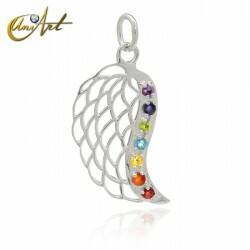 It is a pendant inspired by the Gothic style, being a delicate jewel of great beauty. Its approximate measurements are 36 mm x 18 mm with the handle. 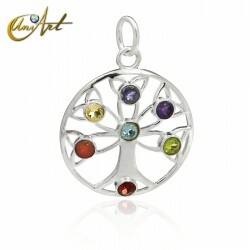 Moon pendant with seven chakras gems in sterling silver. 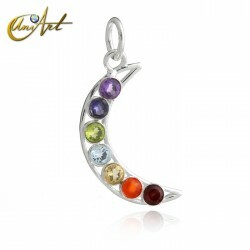 Presenting seven faceted gems that represent the seven chakras this beautiful pendant in moon shape is made in sterling silver. It has about 4 cm x 1.7 cm including its ring and its stones are amethyst, iolite, peridot, blue topaz, citrine, carnelian and garnet, not necessarily in this sequence.